Chop onion, mushrooms and mix with minced garlic. Stir together chopped onions, garlic and mushrooms over a low heat until softened and slightly browned, about 5 minutes. Prepare sauce: in preheated and oiled pan add flour and gradually whisk in heated milk, in order to make a roux, and then cook under gentle heat while stirring with a whisk. Cook until the souse thickened and smooth. Combine Stirred onions and mushrooms with milk sauce. Wash potatoes, then cut each potato in half and carefully scoop out some of the flesh so they will look like potato cups. You can use removed potato flesh for mashed potato recipe later. Place potato cups on an oiled baking tray; fill with stir fried onions-mushroom mix and milk thick sauce; place cheddar cheese cubes and on top place small slice of Emmental (yellow) cheese. You can bake each cup open or cover it with other potato half. 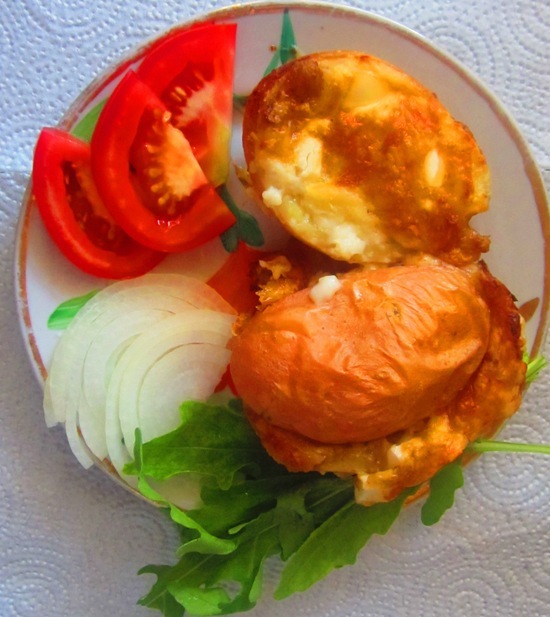 Bake filled potatoes about 30 minutes, until they are soft to the touch and cheese is melted. Remove from oven and allow cooling.